gratitude to my divine masters who indulge me in the joy to know bhakthi, sacred love. the goddess as our mother is always nurturing, kind and ready to forgive and transform our past for however it may be. to seek her as the awakened mother kundalini is being by her warm guiding grace and intense sacred love, bhakthi. this guiding grace of the goddess through human realms evolves us through fulfillment and the fullness(awareness) within void, the surrender, that as wisdom enables us to see all of our perceptive reality as pure energy. 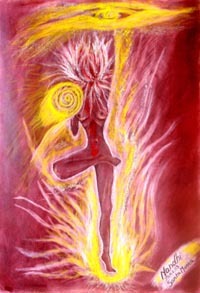 the hatha yoga, the yoga of the body postures, the asanas, is centered around awakening the kundalini fire. this inner fire heals and blossoms all in its ascending path above to seek the grand union. this ascending path is the spine and hatha yoga allows the body to be nurtured by the immense light that moves upward. the visualization of the golden light moving above form the base through the spine helps. better still to enable the mind to sprout as the divine knowing is to be united by love, divine love- bhakthi to make the hatha yoga effective. yoga without spirituality and the worship of her fire witrhin is like enjoying the feast and not being able to digest it. ‘one enjoying the whole within’ is the sacred union of with the awakened goddess with our awareness enjoying the blissful inner fire every breath, as the body allows the mind to be single pointed and is rejuvenated through the upward flowing energies. siddhar rajaswamy, one of my wonderful masters would says, ‘one woman is equal to 9 men’. to know mother kundalini and to worship her passionate embrace is the inspiration that makes the inner dreams come alive… one yogi/yogini expanding himself/herself to the nine dimensions of perfection by grace of the shakthi, the awakened yogini of energy. within ourselves and in the human reality, the goddess worshipped is the completion of the sacred triangle that leads to the union of one. the three in mighty sage adi shankara’s worship was the goddess mother kundalini, the sustaining power of lord vishnu as the mind doing its duty as human; and the essence of siva, the holy ghost- the awakened spirit that is the source of mind that carries the body.. his philosophy was advaita, oneness. the objective of all forms of yoga. enjoy the goddess in her grace that leads us to be One! pure wisdom in being love in itself as the union! yoga and the divine goddess! Chattai Muni Jnanam: the wisdom of this evolved siddhar ‘chatamuninathar’ who wore his body as a shirt, hence the name. 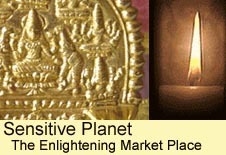 celebrate the sacred evolving grace of the goddess with us! worship the wisdom handed over by our guru lineage as in the ancient palm leaves written. alight the lamp together, soul companions! our worship is above the sahasrara, the higher peak above ourselves, the conscious center of the awakened, blossoming as the thousand petal- the worship here is the most potent. immersed in her sacred vibrations, place the forty triangles of divine perceptions together to bring ourselves to the oneness of the goddess within, the mind the yantra. aum shareen hareeng shareeng tirupura sundariye namaha!